Air pollution generated in urban areas is a global public health burden since half of the world’s population live in either cities, megacities or periurban areas. Its direct effects include initiating and exacerbating disease, with indirect effects on health mediated via climate change putting the basic needs of water, air and food at risk. Air pollution is a global problem with negative health effects on the respiratory, cardiovascular and neurological systems. There is robust evidence that the effects of air pollution span over the life course, with growing children being particularly vulnerable. Diesel vehicles produce disproportionally more air pollution and should be a focus of exposure-mitigation policies. The role of emissions from diesel in contributing to exposure of UK children is reviewed. The adverse health effects of diesel emissions on UK children is reviewed. 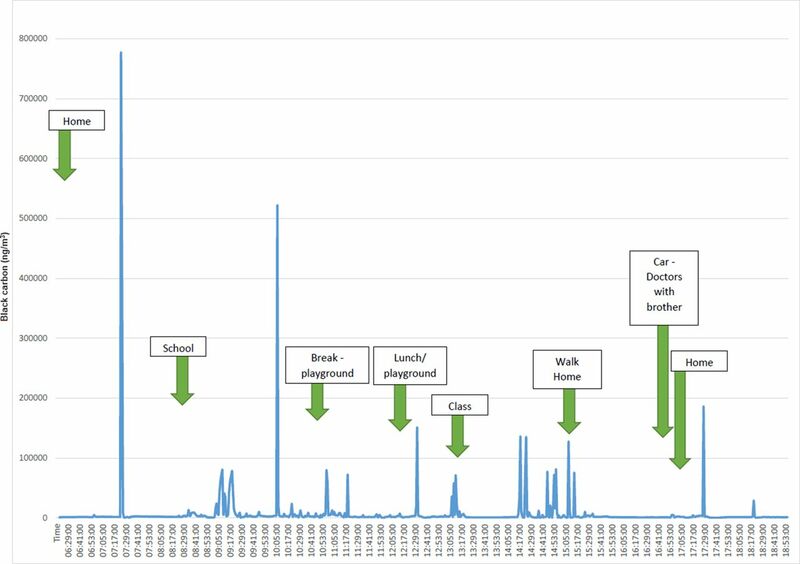 Ways of reducing exposure of children to fossil-fuel-derived air pollution in the UK, on personal and national levels, are discussed. There is strong epidemiological evidence that air pollution is associated with a wide range of adverse health effects on the respiratory, cardiovascular and neurological systems.1–3 Indeed, in the UK, the combination of new-onset (incident) diseases associated with long-term exposure, and exacerbation of diseases once disease is established results in approximately 40 000 excess deaths a year that are attributable to air pollution, increasing health service and social costs by over £20 billion a year.2 Although deaths associated with air pollution are mainly in adults, there is also increasing concern that air pollution, especially from diesel vehicles, has major adverse effects in children and that this has long-term consequences.4–6 In this review, we report the evidence that underpins the need for exposure reduction policy to focus on diesel vehicles and the potential beneficial effects of such a policy on children’s health. Although this review focuses on the heavily dieselised UK environment, it is also relevant to countries where diesel vehicles remain a major source of emissions. The major outdoor pollutants in urban areas are inhalable particulate matter (PM, measured as either PM less than 10 µm in aerodynamic diameter (PM10) or the even smaller PM2.5), nitrogen oxides (NOX, such as nitrogen dioxide, NO2), ozone (O3), sulfur dioxide (SO2), carbon monoxide (CO) and hydrocarbons (HC). 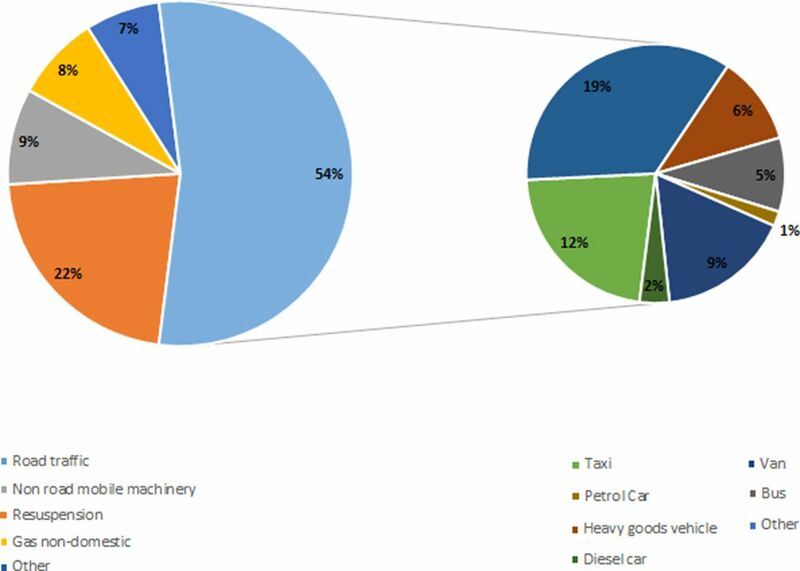 Sources of these include gasoline-powered and diesel-powered engines from vehicles, trains and, in port towns, ships (proximately PM, NOX), vehicle tyre and brake wear (PM), power stations and factories from coal combustion and biomass burning (PM, NOX and SO2),7–9 and wood burning heating that is increasingly popular, contributing up to 9% of PM in London during winter.10 For diesel engines, an important component of emissions is black carbon, that is, the fraction of PM that most strongly absorbs light—a component that is often called ‘diesel soot’. Another pollutant, ozone, is formed by the reaction of NOX with carbon compounds called volatile organic compounds (VOCs) in the presence of sunlight. Two of the most important VOCs emitted by vehicles are benzene and 1,3-butadiene. For emissions from diesel, there is a strong correlation between locally emitted PM10 and NOX,11 and it is reasonable to assume that, where diesel vehicles predominate, either metric is a good marker of exposure to the locally generated pollutant mix in urban areas. While there are other sources of outdoor air pollution, the largest contributor to air pollution in urban areas in the UK is road traffic, which has been rising over the last 60 years. By contrast, active forms of transport such as walking and cycling have been on a decline.2 In the UK, approximately 50% of NO2 emissions come from the roads,14 with diesel engines powering half the cars and the majority of heavy vehicles.15 At a global level, diesel vehicles contribute about 20% of NOx.16 As discussed above, fossil-fuel-powered engines emit carbon monoxide (CO), hydrocarbons (HC), PM and NOx, all of which are associated with negative health effects.17 The reason why diesel engines should be a major target for exposure-reduction strategies is that they emit more PM and NOx than their petrol or hybrid counterparts, contributing to about 40% of all NOx emissions in inner cities.18 19 Furthermore, diesel, and not petrol, soot is categorised by WHO as carcinogenic20—a categorisation that implies that diesel PM is, mass for mass, more toxic than petrol PM. Vehicle emissions are regulated by the European Union (EU) Euro standards, currently at Euro 6 (table 2). Compliance with Euro standards is assessed under laboratory conditions only and are less strict for diesel engines. But even given this leeway, recent measurements under real-life driving conditions have shown that diesel cars produce significantly more toxic emissions than the Euro standard, whereas petrol engines map closely to the laboratory Euro standard (figure 1); this phenomenon is observed globally, and Anenberg et al 16 reported approximately a third of heavy-duty and over half of light-duty diesel vehicle emissions breaching the certification limits, across 11 major vehicle markets. Thus, over 2000 education or childcare providers in England and Wales are located close to busy roads with concentrations of NOX that are regularly higher than legal limits (40 µg/m3 annual mean or 200 µg/m3 1 hour mean).14 21 22 In addition, children attending these schools are exposed to high concentrations of freshly generated diesel pollutants during the commute to and from school and during outdoor activities (figure 2). 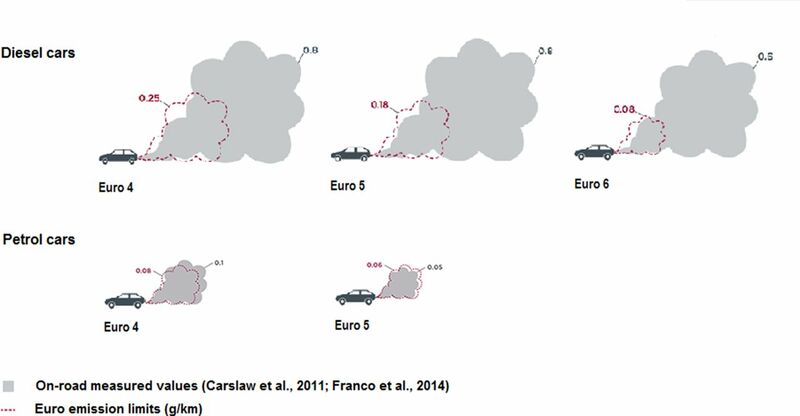 Real-life NOX emissions from diesel and petrol cars compared with Euro emissions standards. Adapted from the Impact of improved regulation of real-world NOX emissions from diesel passenger cars in the EU, 2015–2030 by the International Council on Clean Transportation, 2016. Black carbon levels (ng/m3) from an aethalometer carried by a child in London on a typical school day. In London, diesel vehicles emit a disproportional amount of black carbon. Sources of NOX emissions in London, 2010. Adapted from Lethal and Illegal, Solving London’s Air Pollution Crisis by Institute for Public Policy Research, November 2016. Sources of PM10 emissions in London, 2010. Adapted from Lethal and Illegal, Solving London’s Air Pollution Crisis by Institute for Public Policy Research, November 2016. Air pollutants, particularly NOX (reflecting exposure to both NOX and PM), are associated with reduced lung function in children—for both FVC and FEV1.5 Urman et al 5 showed that an increase of 17.9 ppb of NOX exposure was associated with a 1.56% deficit in FVC and 1.1% deficit in FEV1, and similar findings were seen in children with or without asthma. Residing in areas with high concentrations of PM and NO2 can also lead to suppression of lung function growth in school children.4 31 This reduction can potentially be halted and reversed with better air quality. For example, Gauderman et al 32 showed that reducing the levels of NO2, PM10 and PM2.5 were associated with improvements in FEV1 and FVC growth in adolescents over 4 years—mean 4-year growth in FEV1 increased by 91.4 mL per 14.1 ppb of NO2 reduction, and 65.5 mL per 8.7 µg/m3 of PM10 reduction, and 65.5 mL per 12.6 µg/m3 of PM2.5 reduction, with comparable findings in FVC. Children with existing chronic illnesses, particularly respiratory conditions, are most vulnerable. Air pollution can predispose individuals to new-onset asthma; preschool children are more prone to new onset of wheeze. A meta-analysis concluded that exposure to NO2 is linked to new-onset asthma, while exposure to PM is linked to new-onset wheeze.33 An effect of diesel PM per se on reactivity to inhaled allergens is supported by the association between long-term traffic pollution exposure and allergies.34–36 Asthma exacerbations are also closely associated with short-term variations in PM2.5.37 Although increasing inhaled corticosteroids prior to high pollution days may seem logical,38 it is unclear whether this strategy is effective. There is emerging evidence that air pollution impacts on children’s neurological system and development. For example, associations between exposure to air pollutants and reduced IQ and neurocognitive ability such as working memory, autism and reduced brain-derived neurotrophic factor are widely reported.39–41 In particular, Basagaña et al 39 reported that traffic-related PM2.5 was more strongly associated with reduction in cognitive function compared with fine particulates from other sources such as mineral, heavy oil combustion or road dust. In addition, exposure to high levels of traffic-induced pollutants may delay maturation of the brain.42 An additional emerging link is between air pollution and the endocrine system. For example, Thiering et al 43 reported an association between insulin resistance and either NO2 or PM exposure in healthy children. 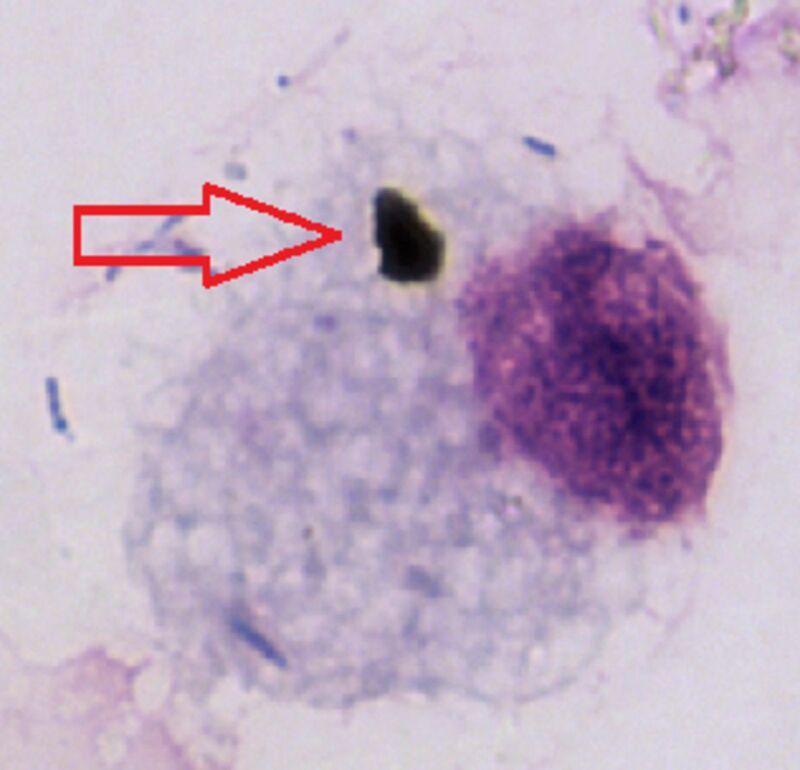 Phagocytosed black carbon (arrow) within an airway macrophage from a healthy child in one of the major cities in the UK. What can we do about diesel pollution? In London, air pollution is mostly caused by road traffic, of which diesel vehicles are a major contributor, as discussed above. With an estimated 9400 premature deaths attributable to air pollution, it has the second biggest impact on public health.19 These highly polluting vehicles should therefore be phased out to comply with legal limits of pollutants—and cleaner alternatives encouraged. Tougher national regulations on traffic emissions such as the expansion of Ultra Low Emission Zones and scrappage schemes for older generations of diesel vehicles should be considered. Indeed, the 2016 report from the Institute for Public Policy Research23 estimated that phasing out diesel-powered vehicles in London would lead to large reductions in NOX and NO2 levels, ultimately lowering NO2 levels to comply with EU standards. This report estimated that with a 45% reduction in NOX and 56% reduction in NO2, 1.4 million life-years would be gained along with a financial benefit of up to £800 million. Planting trees can reduce air pollution by acting as a physical barrier to intercept PM and absorbing gaseous pollutants such as O3,62 although the effect on pollution concentrations at schools is, to date, unclear. However, the amount of pollutants removed by these organic barriers will be proportional to the extent of plantation. Therefore, vast tall hedges around nurseries and schools should be encouraged, but this does not provide protection against pollution exposure during travel to and from schools. Various measures such as walking along less busy roads, cycling, use of public transport and carpooling may reduce exposure to air pollution,63 but the evidence base for whether this is achievable over the long term, and is sufficient to improve health, is limited. The Department for Environment Food and Rural Affairs website provides information and forecast on UK air quality, while the British Lung Foundation provides information on various measures to take according to air pollution levels (table 4). Air cleaning systems are available commercially claiming to reduce indoor pollution—these can either remove particles and gaseous pollutants or have ultraviolet light technology to destroy indoor pollutants.64 All have their limitations, for example, large particles tend to settle before reaching filters, while gaseous pollutant filters may have short lifespans.64 These systems also use electricity—which may not be from sustainable sources. Improvement in our air quality will benefit the whole population with lasting health and economic advantages. We should aim to build cities in order to promote and improve the health of the population. In conclusion, in the UK, the phasing out of the current diesel car, van and taxi fleet, and replacing this fleet with greener alternatives must be a pillar of exposure-reduction strategy. Changes that would support such an initiative are (1) more active travel supported by better public transport infrastructure, (2) providing electric charging points on residential streets, and (3) providing clinicians with the tools to discuss personal exposure reduction strategies with their patients. We thank the International Council on Clean Transportation (ICCT) for their permission to adapt infographics from their website.
. Every breath we take: the lifelong impact of air pollution, 2016. Sources of air pollutants. IARC monographs on the evaluation of carcinogenic risks to humans, No 109, 2016. World Health Organization. WHO global urban ambient air pollution database. http://www.who.int/phe/health_topics/outdoorair/databases/cities/en/. Department for Environment, Food and Rural Affairs. UK Plan for tackling roadside nitrogen dioxide concentrations. Technical report, 2017. Air Quality Expert Group. Nitrogen dioxide in the United Kingdom, 2004. New Car CO2 Report 2017. 16th edn, 2017.
. The pollutant emissions from diesel-engine vehicles and exhaust aftertreatment systems. Clean Technol Environ Policy 2015;17:15–27. Environmental Committee London Assembly. Driving away from diesel: reducing air pollution from diesel vehicles, 2015.
. Lethal and illegal: London’s air pollution crisis: IPPR, 2016. Internation Agency for Research on Cancer WHO. IARC: diesel engine exhaust carcinogenic, 2012. Air Quality Guidelines for Europe. WHO regional publications, European Series, 2000. No. 91.
. Lethal and Illegal: solving London’s Air Pollution Crisis, 2016. European Commission. Air Quality Standards. http://ec.europa.eu/environment/air/quality/standards.htm.
. The impact of air pollution to central nervous system in children and adults. Neuro Endocrinol Lett 2017;38:389–96.
. Air quality and social deprivation in the UK: an environmental inequalities analysis—final report to Defra , 2006. United States Environmental Protection Agency. Guide to air cleaners in the home, 2008. Contributors All authors contributed equally to this review article.